Not sure if it has already been mentioned but I just recovered that by drag/dropping a light or a camera into the viewport it automatically switches to look-through-selected. Not really a secret weapon but I thought this would be the best thread to mention it. maybe they will be useful to you. say you have been blocking out a scene, and you have a low poly tree, and you use it all around your scene, maybe a hundred times. There is a tool for that! (it uses the transforms of your previous meshes, so don’t delete them! it can trace back translation, rotation, and scale.) Just select all your originals, then shift select the new one, and hit replace. Also, check out the modify > snap together tool, no words describe how useful or how many times I’ve used it. as far as the hypershade goes, I love it all, but my most useful is the remap rgb to hsv. I most of the time use one texture, and use this to get my spec, bump, and diffuse information out of just one texture! saves on memory for rendering, and speeds updating those files up. Update the original, and update them all. anyways, there was 31 pages and I didn’t read all of these, hope I didn’t repeat anything! great thread, and good luck. the userSetup.mel code to re-establish shelfButton popUp menus failed if the tablayout was not visible. same name in different paths. symmetry utilities would “break;” without resetting orientaion offset and original parent. mirrors ( or auto-mirrors ) based on pivot location. with the auto mirror scriptJob running… Maya’s tools and actions are all reflected after every edit. Execute this script cly_pivotReflectionModeling to mirror across the pivot position. Stray vertices @ the origin are cleaned “centered”. Holes outside the merge threshold are preserved. If present, edge smoothing at the origin loop is preserved. if cly_autoMirrorScriptJob.mel’s scriptJob UI is running then mirroing is automated on any object after each edit. PREFERENCES” ) THAT IS ALIGNED STRAIGHT WITH THE AXIS OF THEIR PREFERENCE. edge extrudes intersecting ( T ) and even crossing ( + ) the origin are fine. I’ll try to post a video capture of an example workflow later. popUp menu that will get u to all the features under the hood. Throw your favorite grid texture on weightMeClone & create a cam for it. Maybe open a new floating window for weightMeCloneCam. A couple more tips for this procedure. LMB drag + “k” will scroll the timeline. As soon as “k” is pressed, the viewport will turn off weight shaded view and show the texture (if the viewport is in texture view mode). Setting the viewport renderer to high quality will override weight shaded view, so a new cam can be created, set to high quality and then used to watch texture stretching while painting weights. Have u tried ( alt + c ) while painting skin weights? It is a nice fast way to toggle between weight shaded and textured. Didn’t know that one, thanks claydough, very useful. dkAnim for exporting/importing animation curves. Its an older MEL script. But it helped me get out of a tight spot where Maya’s AnimImportExport plugin couldn’t. Only found out what they were yesterday! you can remap every key to another, specialy combinaisons alt+mmb+lmb etc… for exemple i use only one pen button to tumble, zoom, and track. and when the pen buttons becomes too painful i use keyboard. 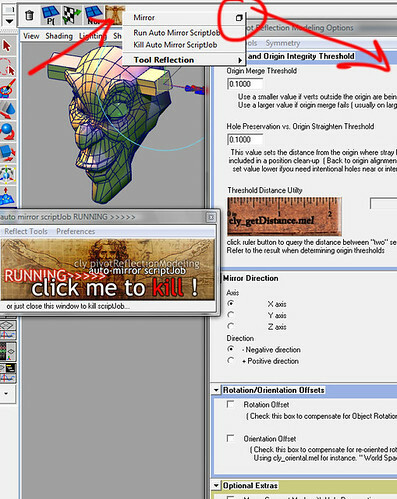 that free scripted freeware can use many hotkeys sets depend on the software you are, so you can manage same hotkeys for maya max roadkill (except the tumble tool of zbrush wich is very particular), even it can detect the marking menu and remap your keys.